The rocker visited a youth services centre in New Jersey's largest city as the final stop on a "listening tour with disengaged youth," which previously made stops in New Orleans, Atlanta and Houston. The initiative is part of the New Jersey native's role as a member of the White House Council for Community Solutions, which is looking at successful youth programs that can be replicated. 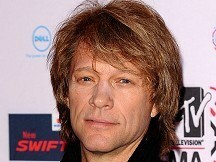 "I'm a big believer in the youth," Bon Jovi said. "And this was an opportunity to be heard, while I was listening." The council plans to report its findings and recommendations to the Obama administration, which cites the statistic that less than half of young Americans have the education, skill and training to compete in the workforce by age 25. Participants in the Newark session told Bon Jovi that jobs, a lack of mentors for young people and bullying were among their top concerns. Bon Jovi, who said he was flying to Europe to resume his concert tour, said he felt his visit to Newark to hear from young people was just as important as his work in music. "I get great pleasure, pride and joy in giving back," Bon Jovi said. "I'm very proud to be part of this president's council, and just to underscore, it's not political, but I really feel at 50 years old, I should do other things than sing in a rock n' roll band."